Music was provided by Brian Francis Slattery and his amazing band! Some years ago a "52-books-in-a-year" meme sprouted up, in which people "challenged" themselves to read a book a week for a year. I thought at the time, as I do now, that this is an absurdly small number of books; reading for merely a half-an-hour to an hour a day one can easily polish off a book a week (depending, admittedly, on the length and difficulty of the book and the reading speed of the individual). Considering that the "average" American supposedly watches four hours of television a day, sacrificing a quarter of that to book reading doesn't seem like much of a challenge, and I'm under the impression that most bibliophiles read quite a bit more and watch quite a bit less. To prove the point at the beginning of 2009 I decided to simply keep track of my reading. My final tally came to 125 books. You can see whole list at Library Thing. (The Doc Savage book "The Man of Bronze/The Land of Terror" counts twice as it's two books collected as one.) Below are short reviews of the best of this list. It sure is pretty. And small, and light, and easy to read off of. There's just one major problem with it. The software with which you put books on it from your computer only runs on Windows. Now, if this device had just been released I might be able to excuse this, since they might just have Windows available for the release and be working on a Mac (and perhaps Linux) version in the future. But the Sony Reader first came out in 2006. They've had years to port their software over, and it seems glaringly stupid to cut out a huge portion of their market this way. Stanza, the ebook reader for the iPhone/iPod Touch that I blogged about previously, finally has a program that allows you to transfer books from a Windows machine to your device. (Previously, only a Mac version existed.) The program installed much more cleanly than that of rival BookShelf's, and I moved a PDF book from my computer to my iPod Touch wirelessly with very little trouble. 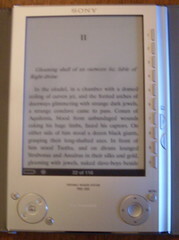 Stanza is clearly the best ebook reader for the device, there is just no contest anymore. Today he had a wide range of observations on the industry, including the Amazon Kindle book reader, which he said would go nowhere largely because Americans have stopped reading. Of course, as EnGadget points out, you're reading this right now.